She’s is a Mother, a Tui & Taite Music Prize award winner and one of Aotearoa’s most beloved Hip Hop-inistas; Ladi6 took a moment out to have a chat with me about her on-tour fashion & beauty go-to items, her lust list of tour destinations she would love to visit, as well as giving you her inside scoop on where to nab the best fashion…worldwide! What are your top 3 go-to items of clothing while on tour and why? Right now I have a Blue huffer dress I’ve been wearing every day, a black Moochi dress I’ve worn at my last two shows including Glastonbury Festival and I just bought this incredible vintage bomber jacket that has old nautical style motifs in bright, happy colours. It also has shoulder pads – which I love! If I could have a fourth, they would be these adorable black with white polka dot Ksubi sunnies I borrowed from the Public Library showroom and have accidentally bought with me and worn at most gigs! Eekk! What are your top 3 go-to items of skincare or make-up while on tour and why? I moisturise daily, especially in Europe as my skin dries out a lot! At the moment I’m using a moisturising oil from Martina Organics, also MAC wipes are my make-up removing saviour! And I absolutely love my black mascara and eyeliner which are also MAC. What’s the best item of clothing or skin care / make-up you’ve picked up on tour, what is it and where did you get it? I wasn’t on tour, but I was in Thailand just after touring Brazil and my cousin Isalei gave me some organic natural matte finishing powder, I cant remember where its from, but its amazing! Who would you say is your fashion inspiration for your touring wardrobe and why are they? Look I’m a bit more simple than your average girl, I don’t really have a touring wardrobe as such, I just try to wear something that’s comfortable and that I feel good in. Are you a pack the week before or the night before kind of a girl and why? Night before; and I stress and turn into a traveling bridezilla, if ya know what I mean! It’s best to steer clear unless you want to keep me company and talk to me while I pack! What are your essential carry-on items for travel? pen, journal, laptop, ipod, headphones, eye mask, ear plugs, coat, healthy snacks, biggest water I can find – my long haul version! If you could pick only one place to tour for the rest of your career, where would it be and why? Will have to get back to you after my first US tour, but Rio and Sao Paolo were not bad at all, Portugal is up there, along with Samoa, Sweden, Finland definitely feature in my top 5 so far. Also Rarotonga is never bad! France is amazing too..Barcelona! How does anyone choose an answer to these kind of questions! …a good bed and a good sound check. What’s your tip for finding a healthy and budget friendly dinner to keep you fuelled for a gig; despite it perhaps being your first time in that city? Finding a good supermarket and keepin’ it fresh and raw on the road helps this young Mum out, so much!!! You’re shipwrecked! You’ve got seconds to grab 3 handy items from your bag or around you to take to your deserted island – what are they are why? What’s your top form of entertainment on a ‘long-haul- flight? Movies! I love them!! I intersperse that with my book, writing and sleeping and I’m a happy girl! Where is the top destination that you’d like tour that you’ve yet to visit? The States and more Asian countries. So far we have played in Korea and Japan, I’d like to go to Hong Kong and also back to more places around Japan. Thailand would be great! Imagine playing in Cambodia?! Check out Ladi6’s video for ‘Shine On’ Keen to catch Ladi6 live and on tour? You’re in luck! 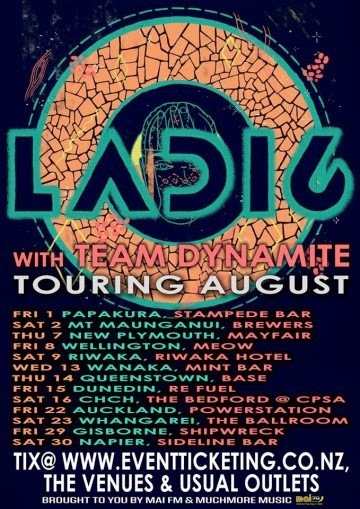 Ladi6 is currently touring NZ with dates yet to play in: Christchurch, Auckland, Gisborne and more – hit up Event Ticketing to get your tickets now! RIP Joan Rivers June 8, 1933 – September 4, 2014.